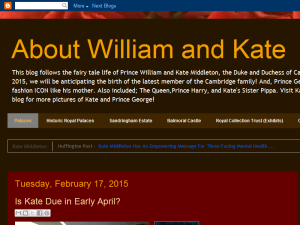 This blog follows the fairy tale life of Prince William and Kate Middleton, the Duke and Duchess of Cambridge. As we approach the Spring of 2015, we will be anticipating the birth of the latest member of the Cambridge family! And, Prince George is growing up fast, turning into a fashion ICON like his mother. Also included; The Queen,Prince Harry, and Kate's Sister Pippa. Visit Kate-Duchess of Cambridge, our companion blog for more pictures of Kate and Prince George! This what your About William and Kate Blog Ad will look like to visitors! Of course you will want to use keywords and ad targeting to get the most out of your ad campaign! So purchase an ad space today before there all gone! If you are the owner of About William and Kate, or someone who enjoys this blog why not upgrade it to a Featured Listing or Permanent Listing?